Tithoes is the Greek version of the Egyptian name Tutu, which is perhaps to be interpreted as 'the statue-like one'. The hieroglyphic inscriptions from the temples of the Graeco-Roman Period and from various monuments from the Late Period characterize Tutu as a lion god, the 'powerful son of Neith'. The god can often only be identified through the iconography; he usually is shown as a walking sphinx, but is sometimes depicted as a lion or human with a human or lion's head respectively. The head of the sphinx often bears the royal attributes - nemes, uraeus, beard and crown. He often appears in reliefs and on stelae, but also as an amulet as well as on coins from the Roman Period. Various statues and a terracotta fragment have also been found. 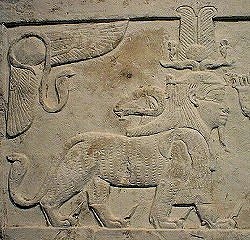 The evolution of Tithoes into a universal god can be seen in the composition of various depictions; the sphinx body is sometimes crowned with several heads - a crocodile or lion's head can rise from his chest while at the same time a ram's, lion's or ibis head appears on his neck. Sometimes there is a falcon's head on his back as well. The occasional presence of a complete crocodile or falcon indicates that the heads represent divine powers whose characteristics Tithoes is 'borrowing'. The sphinx can have wings and his tail is usually a snake, sometimes wearing a crown. Small snakes or scorpions can often be seen at the ends of his paws, or even griffons armed with knives or other weapons. The large snake, usually a cobra, shown at Tithoes's side must not be seen as an enemy crushed by Tithoes, but rather as a depiction of the two attendants of the god on his right and left sides. In cult reliefs the face is often shown frontally in order to create a link with the worshipper. Tithoes appears to have been a popular god, worshipped by ordinary people. He has an apotropaic character and is linked to the warrior Bes and to Neith-Athena. Just like these two gods, he was considered to protect believers from all danger whilst they were asleep. Tithoes was worshipped all over Egypt - the earliest evidence dates to the Saite Period. Through his descent from Neith, Sais and Esna are the most obvious cult centres, but Per-wedj (10th Upper Egyptian nome) and the Faiyum were also important. Tithoes's general popularity is a late phenomenon. Outside Egypt, a stela of Tithoes has been found in Thracia and he also appears to have been known in Roman Italy.